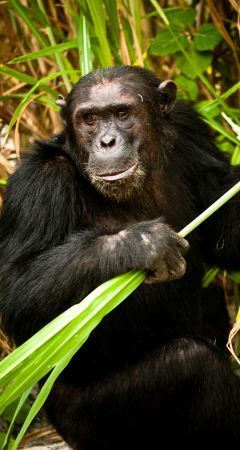 The main draw for visitors to the scenic Mahale Mountains National Park is the Park's wild chimpanzee population - it is home to about 800 resident chimps. The Mahale Mountains National Park is one of Tanzania's most scenic Parks. It is situated on the clear blue waters of Lake Tanganyika, which is surrounded by sandy coves and beaches, but it is not just the lake that gives the Park its beauty - it is also the rainforests and the rugged Mahale mountain range that runs right through the centre of the Park. Having said that, it is also one of the least visited of the National Parks, purely because it is so remote. The Park is completely inaccessible by road, so the only way to get here is by boat or to fly into the Park. There are only a few lodges in the Park. Size-wise, it is just over 1,600 km², and is often combined with a safari in the Katavi National Park for people wanting to do a full Western Safari Circuit. The main draw for visitors to Mahale is the Park's wild chimpanzee population - it is home to about 800 resident chimps, who live in different groups. One group in particular - the M-Group - are very habituated and used to seeing humans - so much so you can have an extremely close up and personal encounter with one of them if you are very lucky! Tracking the chimpanzees on foot with your guide through the rainforests is a wonderful and unique experience, and very rewarding when you eventually come across them, playing and grooming each other and totally relaxed in their natural habitat. The best time for the forest walks is during the dry seasons months, so between May and October. Visitors are requested to wear a face mask when observing the chimps, however, as primates are highly susceptible to human diseases including flu and colds, so the mask is to protect any germs being passed on from human to chimp. It is not just about chimpanzees, however - the Park is also home to at least 50 other mammal species - mainly other primates, warthogs and antelope, and a few lion and leopard. Other activities that can be enjoyed during a stay in the Park include snorkelling and fishing in Lake Tanganyika - the world's second deepest lake with some parts reaching a depth of one mile - which really does make a stay here completely different and unique! There are also no roads in the Park, but there are numerous walking trails to follow and explore. The Beach Tents have been strategically placed at the edge of the cooling forest canopy. Each Beach Tent is on a raised platform under thatch, and have a private deck providing views of Lake Tanganyika and the beach. Your accommodation is in wildly exotic wooden bandas, looking out across the soft sand beach, with interiors fashioned from old seasoned dhow timber and decorated with style and panache. The 6 open-fronted bandas are set just on the forest line, looking out over the lake, with a private upstairs chill-out deck.